Year 2002. Equipped with the C controller. 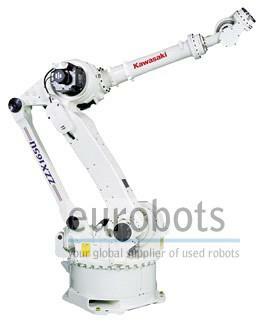 The ZX Series Robots are the work horses of the Kawasaki Robotics product line. Automation applications around the world utilize Kawasaki Heavy-Duty Robots for spot welding, material handling, sealing, die and investment casting, material removal, machine tending, as well as numerous other demanding tasks. 1. Improved Cycle Time—A cycle time improvement of 10 to 20 percent for typical spot welding applications, compared to U series robots. 2. 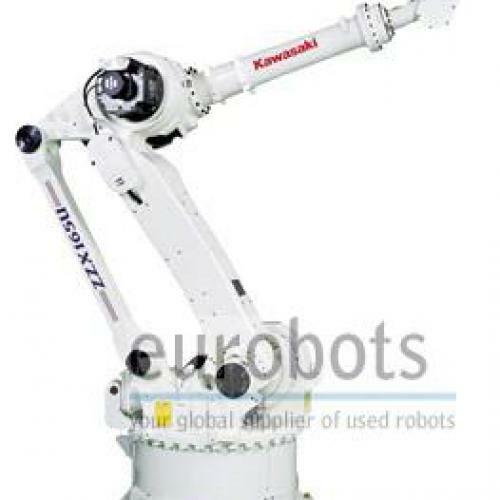 Large Work Envelope and Low Power Consumption—Large work envelope due to long reach and small dead space.The patented Kawasaki Hybrid Link Configuration allows turning backward with low power consumption. 3. 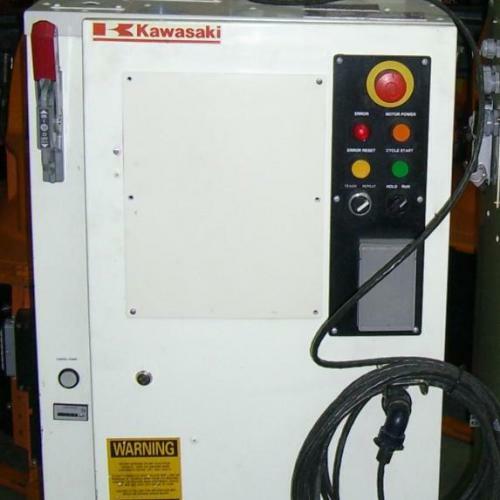 Space Saving and Easy Installation Footprint—Small footprint and integrated air piping, wiring for the valve, and forklift pocket is standard for all models. 4. 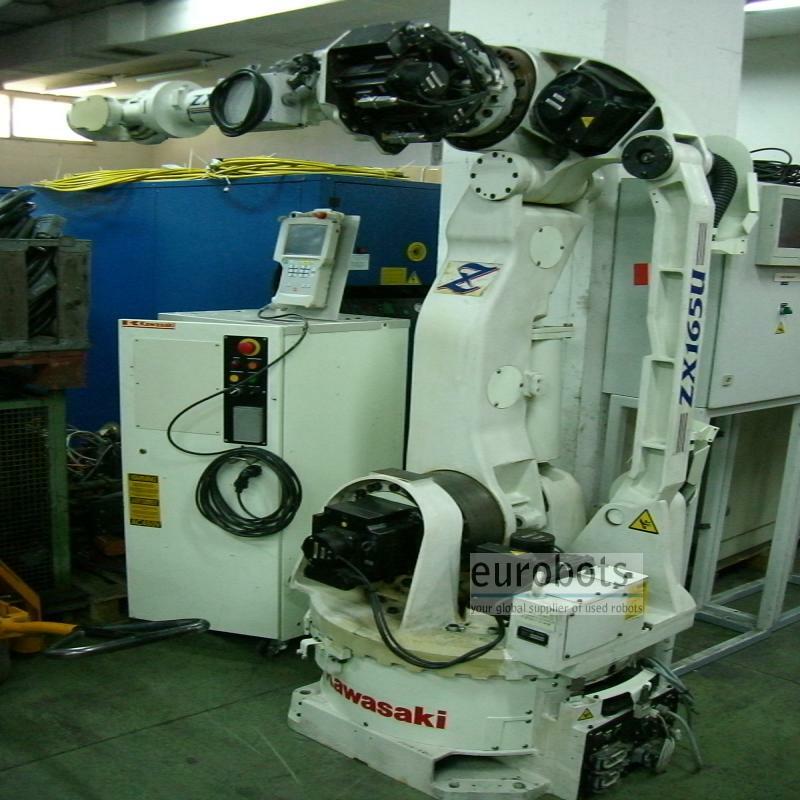 Upgradable– The ZX165U can be upgraded to a faster or higher payload robot by simply replacing hardware and software—alteration at the production site is easy and economical. The C Controller is compact enough for convenient installation and offers a large, multifunction, color liquid crystal display (LCD) that combines the functions of a conventional teach pendant with several specialized displays on a 7.2 inch touch panel. Easy block step programming and high-end AS Language programming are both available. 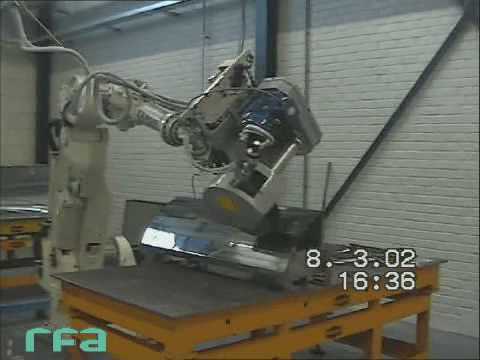 Maximum Load of Robot: 165Kg.